it would be nice to see which curve profile is linked to the currently selected curves/ribbon object - ideally with a way to rename and reassign them. Else it’s quite easy to unintentionally alter other hair elements when all you wanted is to change the curve profile for the selected object. use ctrl+shift+H -> edit curve profile to change segments, width etc. it is not directly possible. 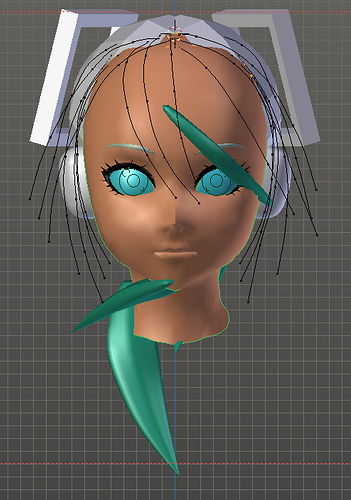 Workaround would be to delete Bevel object (image below) on hair curves, and then run -‘add ribbons’ on hair object. This way you will have new unique profile assigned to hair object. Sorry for late reply. Hope it helps. Tbh it’s not quite what I was looking for but at any rate thanks for getting back to me! Would require the user to select some CVs - ideally tips or roots - first and then have a function << and >> that selects the next/previous CV on the curve and deselects the previously highlighted ones, effectively letting the user move forwards or backwards on a curve. Would be helpful to edit a bunch of curves at once. E.g. you start at the tip, reposition that, and now want to advance to the next CV to edit that and so forth. It’s good idea to have option to step through vertices. I will add it . This looks like a great tool. But not for USD$34. I have something that does essentially the same thing that I brought a year ago for $10. It is not as convenient as this addon and does not have as many features but for $10 the price was right. But congrats. it looks like a great and much needed tool. Just by curiosity, what tool are you refering to? On the other hand, this tool is absolutely fantastic and I wouldn’t judge it without giving it a go. I purchased it when it was first released, and I have to say that if use hair cards often in your work, this addon is worth every penny. joebount. I purposely left out the name of the other tool I think it would be rude to even inadvertantly promote some other thing in this tread. PM me if you are really interested and NO I have not commercial interest in that other tool. It just did what I needed done and the price was right. This tool seems to have a LOT more features. I’m trying to use Children in particle mode (Generate Children checkbox) but it doesn’t seem to be working. When I check the box, most of my curve ribbons just disappear. Is there something I have to do to make it work? Thanks. @Oscalon , - you mean children in interactive hair combing? do you have latest HT version and blender installed? Is there any error in console? If so, can you give me blend file. I seems to be working ok on my end. Yes, children in interactive hair combing. I have the latest versions installed and no errors in the console. When I turn on Children, it sticks most of my curve strands down on the origin point at 0,0,0, and some randomly scatter on the head. Where can I send the file so as not to post it publicly? EDIT: Upon further investigation, it looks like they were being spawned all over the body (which is masked). When I use a density vertex group, then they spawn in the correct areas. But they aren’t very useful with strands this large, as they just clip into the head a lot. It seems I also no longer get the parent strands showing up when I use them. Yep, to limit child strands spawn positions you can use vertex mask eg. on top of head scalp. About clippint - there is no easy way around it in this case. See bellow - you have 3 parent strands, that spawn fourth green strand. Because green strand is interpolated between different parents - it goes through ball. 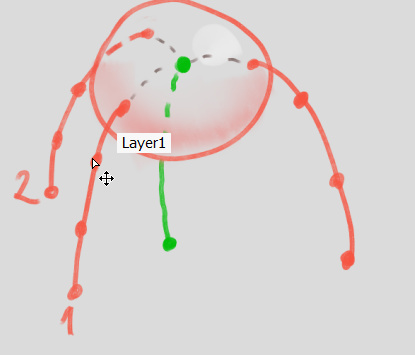 Or you can just draw manually more strands - using particle comb -> ‘Add’ Brush, and skip the children completely. I can add the ‘Add Parent Strands’ checkbox for child particles if you still want it. Thanks for the info. What I’m looking for is to get an effect more like Children based on radius, whereas it looks like the current implementation is Interpolation. So to have parents showing, and then a number of children spaced around each parent that have some randomization to their length, position, and smaller curve radius. Currently I’m getting a decent effect by making the parents into a mesh sheet, then running hair tool on it again to make several smaller strands off of it. But since that’s a two stage operation, it’s difficult to visualize. EDIT: Another thing I’ve noticed is that if I’m using particles with interactive hair curve ribbons, and I enabled Tilt aligning, then slowly my performance degrades until I have noticeable input lag. Reloading the file fixes it. This happens even if I disable the tilt aligning. It does not happen with tilt aligning done in object mode. Simplified and improved ‘GPencil to curve’ in 1.9.3 HT release and it support pen pressure. So if you draw PG strokes with tablet, curves will have nice taper too. @Oscalon I added ‘Include Parents’ - option in interactive hair combing - this will take into account Parent strands when using ‘generate children option’. I cannot recreate the slowdown you were writing about. 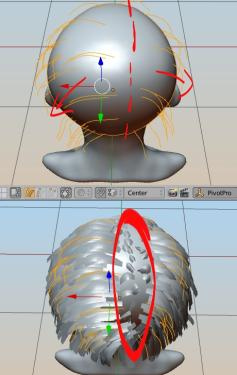 About spawning child particles spawn around parents, this is not supported yet, it would require rewriting big portion of interactive hair combing. But for now you can use non interactive ‘Particle hair to Curves’ - this combined with build-in ‘Simple’ child particles should give you what you want. Both these issues do not happen for me after rolling back to 1.9.2. Haven’t tried the versions inbetween. Identical experience on 2.79b Windows and macOS. Like relax for mesh vertices but applied to a curve with the aim to make it easy to smooth out kinks in curves, caused by offset/stray CVs. Should look at the selections’ neighboring CVs and average positions accordingly. Ideally would work on selections of multiple CVs across curves and multiple CVs of the same curve regardless of the curve type. Also should take CV twist and scale (ALT+T, ALT+S) into account. As for new features. CV is curve vertices ? There is already build in curve smoothing for curve vertices, tilt and radii. The smoothing according to neighbors - I assume this would smooth out curves spacing right? This may be hard to do, but I will to think about it. Also there is first blender 2.8 release. Some features are missing, and bugs are there. Do not use for production. Do not report but yet. This is just for testing. 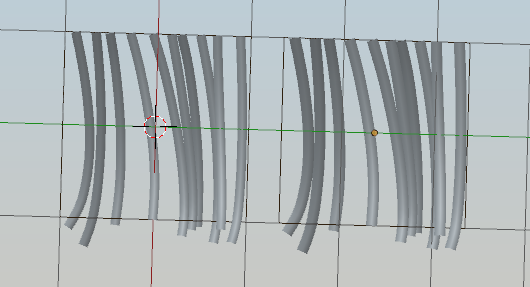 What works: Curves from Grid surface, Interactive Hair combing (but crashes sometimes). Most curve operations should work (smooth, taper etc). 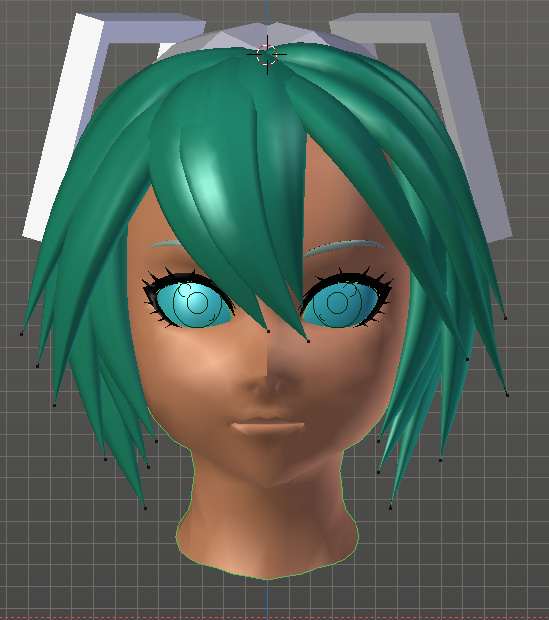 There is also new option in ctrl+shift+H option, to load default hair material. Manual and update video will be updated when things are more polished. Excellent! Do you have ny idea for developping it further? Also, if you are removing grease pencil, what are you planning to use instead?